In our daily lives, we lymphies need to make a lot of accommodations for our lymphedema. One such accommodation is travel. This doesn’t mean we can’t do it, however – it just means we have to take a few more precautions. 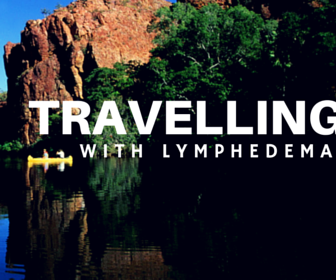 I haven’t let lymphedema get in the way of my travels! Here I am during a trip to Australia in 2007. Traveling can be an invitation for swelling – you are often sitting for long periods of time with no elevation or relief, causing the fluid to gather in your affected limb. If you’re traveling by air, there’s even more swelling, thanks to the decreased cabin pressure. It’s uncomfortable, it’s annoying, and it’s oftentimes unavoidable. But there is some relief! Drink fluids! Drink more than your usual intake of water, juice, or other non-alcoholic, non-caffeinated fluid before and during your travel. This will help you to avoid dehydration! No heavy lifting. If you have lymphedema in your arm, do not lift heavy baggage. Ask someone for help! Investing in rolling luggage (suitcases with wheels) is also advisable. Dress comfy. Wear loose, non-constricting clothing. This will lessen the stress on your lymphatic system, as well as make you feel a little more relaxed. Wear compression garments. This is Lymphie 101! It’s very important to wear your compression garments during travel. You may even want to wear more than one if you are traveling by air, to keep adequate pressure on your affected limb. Protect your skin. Wear sunscreen! Any abnormal increase in blood flow – such as sunburn or infection – will cause an increase in lymph fluid buildup. You should also make an effort to wear some DEET-free insect repellent, because insect bites can lead to infection, which are risky for lymphies. Make sure to pack sunscreen, insect repellent, medication or topical antibiotics, and anti-fungal powder to treat any sort of risks should they occur! Don’t remove your shoes. If your leg swells during travel, it will be harder to put your shoes on afterward. Perform in-flight exercises. If you have lymphedema in your arm, bring a squeeze ball. Keep your arm elevated as much as possible. Roll your shoulders, as well as your wrists. If you have lymphedema in your leg, walk around for at least 10 minutes every hour (as long as the “Fasten Seatbelt” sign is not lit). Do some easy muscle pump exercises, such as rolling or rotating your ankles, alternating between lifting the heels and toes, etc. Any sort of movement will help to stimulate your muscles and will help pump the lymph fluid. Have as much leg room as possible. Sitting in an exit seat – or paying the extra for First Class – is definitely a plus. Having leg room will give you the space you need to perform your in-flight exercises. It will also allow you to be more comfortable, and to accommodate your affected leg a lot easier. You should also request an aisle seat, so you can get up frequently without disturbing your seatmate. Got any tips or travel stories of your own? Share them in the comments section! No worries! Thanks for your encouraging words. You should definitely wear your stockings during your flight, and do some simple in-flight exercises like rolling your ankles and pointing your toes up to your knee (if that makes sense visually?).. you’ll do just fine! I hope you have a safe flight, Liz! I am new to lymphedema, diagnosed in March of this year. I am not yet in pull on compression garments for several reasons, including a large ulcer on my right lower leg. Just had a skin graft to help close it and I’m hoping I might be ready for more “standard” compression wear in the next few months. Until them, I will continue to wear wraps on both lower legs and velco closure thigh wraps at night. I have a question for those who are more experienced. I am having a horrible time finding shoes that I can fit into. My feet do swell, but even when not particularly swollen, my wraps make it impossible to fit into normal shoes, even wide width men’s shoes. I’ve been wear Draco cast shoes on both feet as that seems to be the only option. Does anyone have any other suggests? I would be most greatful. Tammy I also could not find any shoes to fit my affected leg, I ended up getting a pair custom made, super expensive but unfortunately very necessary – good luck. I also had to wrap for several months because of a stubborn infection. I found a pair of men’s size 10 Croc knock offs worked. Just remember, wrapping is a temporary measure so you don’t want to spend a lot.